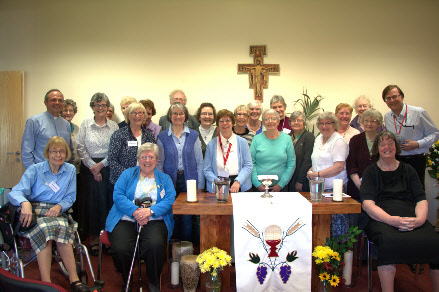 The Retreat, held from Tuesday 19th to Thursday 21st April 2016 at the Conforti Institute in Coatbridge, was led by Revd. Canon Paul Watson, Diocesan Chaplain for the Diocese of Aberdeen and Orkney. His theme picked up on the Mothers’ Union theme for this year A Celebration of Faith with the sub-theme Living with God in the every day. It was good to meet up and chat with folk we knew, enjoying sitting in the sun and munching strawberries. We didn’t go into silence until after dinner. There were four talks over the three days, the first being before Compline on Tuesday evening. Paul handed out leaflets for each of the four talks with questions to think about at home afterwards. Faithfulness means to obey Christ as an act of love and should not be done blindly, out of fear or in a grumbling and murmuring manner. The root of obedience is this free humble loving surrender to the will of God, that says Yes as a whole person to the infinite love of God. ‘Faithfulness is consecration in overalls. A lot of the road to heaven is driven at 30mph.’ There can be no evasion of reality – however dreary, boring and unfruitful it may seem. Stability is achieved through perseverance, through holding on under great strain, so that we can become a ‘living ardent tool’. We need to accept other people as they are. True acceptance means allowing others the space to be themselves and to change. (compare with life in a monastery - the stability of community life). Praying is being sunk in God like a fish in the sea. The still small voice – The Kingdom of God begins with us. Why do we think God’s voice is usually so gentle and easy to miss or dismiss? Coffee followed at 10.45 and then Eucharist including a short refection before lunch. The afternoon was free until tea at 4pm. Many sat in the garden or had a walk in the sunshine. Evening Prayer at 4.30pm was followed by Talk 3: Worship – reference text: Romans 12:1-5. Regarding the Upper Floor. Paul compared the Benedictine vow of stability which needs to be held in creative tension with God’s unpredictability. This means living provisionally and being willing to let go when God surprises us with something new. Think about St. Paul – forgetting what is behind me and reaching out for that which lies ahead, I press towards the goal to win the prize which is God’s will in Christ Jesus. (Philippians 3: 13) The house of the soul is built so that each level demonstrates some of the fruits of his Spirit. Downstairs there are the public virtue of Justice and the homely virtues of Prudence, Temperance and Fortitude which humble and discipline us. Upstairs there are heavenly powers of Faith, Hope and Charity tending towards the eternal and nourishing our life towards God. We are called then to worship God through growing towards holiness through our love for Him and our love for his world. This involves both attachment and detachment; the most careful and loving fulfilment of all our varied this-world obligations, without any slackening of attachments to the other-worldly love. The day was brought to a close with dinner followed by Compline. In a departure from our usual practice, Paul offered a discussion period after Compline, which most of us took part in. Forgiveness is an important part of all relationships. Most of the time we will need to forgive even when the other person does not realise they have done anything wrong. Living in community is never easy, whether this is as a religious order or within our own families. We wound each other so easily and quickly. This is why forgiveness lies at the heart of community and is also the greatest factor of growth for any person. Paul offered us the chance to comment on his talks and what had touched us most. Paul then divided us into six small groups and tasked us with discussing with each other our prayer concerns and from which we would agreed to pray for the concerns every day for a month. This overran its allotted time considerably! The final Eucharist came with a short reflection and closing words. All the worship and talks took place in the Oratory and the services were interspersed with many hymns/songs. There was the opportunity for those attending to choose favourites. Silence officially ended and votes of thanks were made as well as a gift to Paul for leading us so well. There was much chatter over lunch with a donation made to the staff for looking after us so well. So it was farewell until next year. The picture above shows most of the 2016 retreatants (some had to leave before the picture was taken). There are more photos in the 2016 retreat photo gallery available by clicking here.